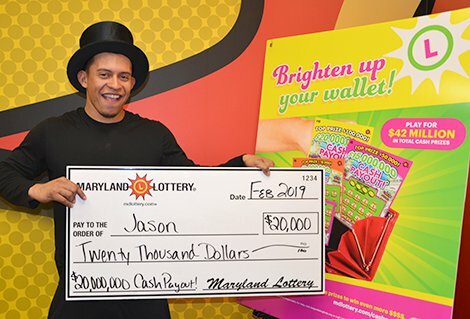 “Jason” of Hyattsville picked up a $20,000 prize on the popular $20,000,000 Cash Payout! scratch-off game. It only takes one instant ticket to win. An infrequent Maryland Lottery player from Hyattsville proved this fact on Feb. 13 when he happily claimed a $20,000 winning instant ticket in the $20,000,000 Cash Payout! game. “If you’re going to win, you’re going to win,” says “Jason,” who bought his lucky $10 scratch-off at Variedades Delmy’s, a convenience store in Landover where he worked. “Jason” still frequents the store, in part to chat with friends and former co-workers. He sometimes lingers over a scratch-off “just for kicks.” On the day he found his Lottery fortune, “Jason” matched the numbers on his scratch-off and realized he won the first of the game’s 14 $20,000 prizes. “I was kind of shocked,” he said, flashing a smile. When the shock wore off, he made plans for the proceeds. He will pay off the balance on his car loan and some other bills. Also, a celebratory dinner out with the family is in the works for the 24-year-old player.